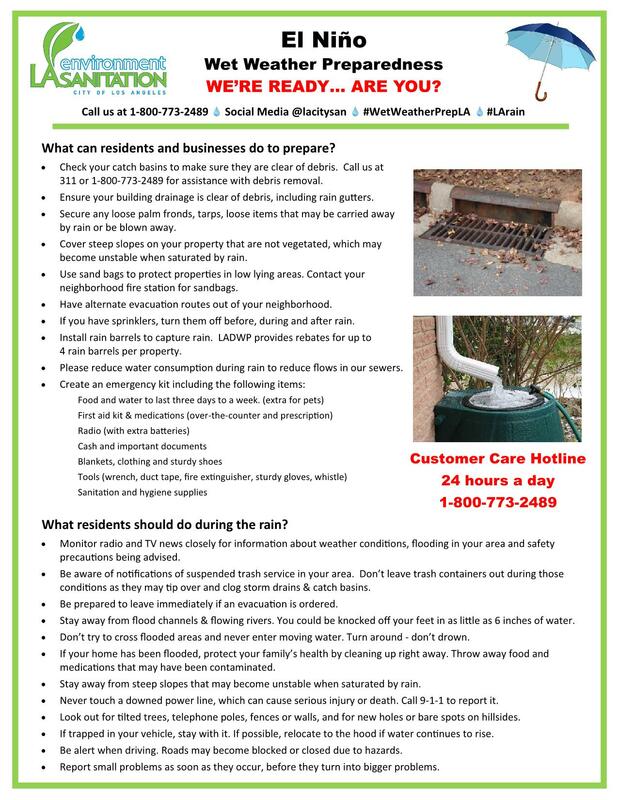 Northridge East Neighborhood Council | Making Northridge, CA a Better Place to Live, Work, Play, and Learn | El Niño Wet Weather Preparedness: WE’RE READY… ARE YOU? 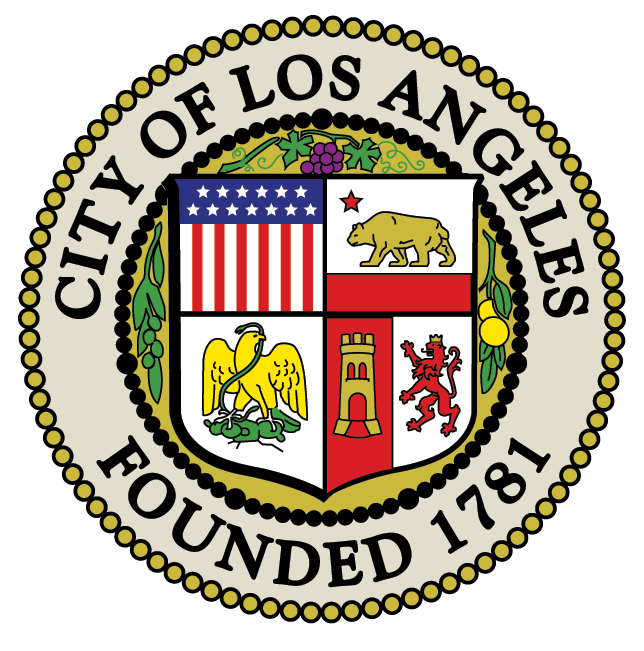 Each year, LA Sanitation (LASAN) prepares itself and Los Angeles residents and businesses for the rainy season. This year, we are anticipating El Niño, which will likely cause higher-intensity storms and potential flooding. What can residents and businesses do to prepare? Check your catch basins to make sure theyare clear of debris. Call us at 311 or 1-800-773-2489 for assistance with debris removal. Ensure your building drainage is clear of debris, including rain gutters. Secure any loose palm fronds, tarps, loose items that may be carried away by rain or be blown away. Cover steep slopes on your property that are not vegetated, which may become unstable when saturated by rain. Use sand bags to protect properties in low lying areas. Contact your neighborhood fire station for sandbags. Have alternate evacuation routes out of your neighborhood. If you have sprinklers, turn them off before, during and after rain. Install rain barrels to capture rain. LADWP provides rebates for up to 4 rain barrels per property. Please reduce water consumption during rain to reduce flows in our sewers. Rainy season is officially here but the heaviest rains are expected December to February. There are 6,700 miles of sewer pipes in LA, and LASAN conducts proactive maintenance year-round to prevent clogs, flooding, and pests. There are 67 pumping stations to move sewage through the pipes to the plants. The City of Los Angeles has 4 water reclamation plants. The largest can treat up to 600 million gallons per day – that’s enough to fill 909 Olympic sized swimming pools! Streets are designed for water to flow to the edges of the streets in heavy rains – this could flood sidewalks so stay aware and watch where you walk. Catch basin screens will automatically open when it rains – during dry periods the screens are there to catch trash and other debris. We’ve cleaned all our 40,000 catch basins to remove debris that could clog them; we will clean them again during the season. We’ve cleaned all of our 70 debris basins – many of these will get 2 more cleanings during the wet season to remove debris and keep stormwater flowing. We have cleared drainage channels to allow stormwater to flow properly. We are in close communication with City departments and LA County to coordinate preparation & response efforts, and to push out collaborative messages as needed. We will dispatch emergency crews throughout the City during severe to respond to any flooding. LASAN Customer Care Center will open 24/7 to receive customer requests. *During heavy rains, please limit calls to critical and rain-related issues. What residents should do during the rain? Be aware of notifications of suspended trash service in your area. Don’t leave trash containers out during those conditions as they may tip over and clog storm drains & catch basins. Be prepared to leave immediately if an evacuation is ordered. Stay away from flood channels & flowing rivers. You could be knocked off your feet in as little as 6 inches of water. Don’t try to cross flooded areas and never enter moving water. Turn around – don’t drown. If your home has been flooded, protect your family’s health by cleaning up right away. Throw away food and medications that may have been contaminated. Stay away from steep slopes that may become unstable when saturated by rain. Look out for tilted trees, telephone poles, fences or walls, and for new holes or bare spots on hillsides. Report small problems as soon as they occur, before they turn into bigger problems.